(MENAFN - Daily Outlook Afghanistan) Historically, the formal relationship between Afghanistan and Iran started with gaining independence of Afghanistan from Britain by Ghazi Amanullah Khan, specifically after 1919. In 1920, Kabul sent a group of delegate to Tehran suggesting to friendship negotiation, exchange of ambassadors, and establishment of Afghan consulate in Mashhad and creating trade and postal relationship between the two countries. After a year, in 1921 Afghanistan signed a treaty of friendship with Iran when Iran was under the Qajar dynasty. In September 1961 the ties between two countries were broken off but resumed in May 1963. Prior to 1979, the year in which both Iran underwent the Iranian Revolution and Afghanistan was invaded by the Soviet Union, the issue of water rights of the Helmand River was an issue of great importance between the two nations. Disputes over the Helmand water are noted in the 1870s, flaring again after the river changed course in 1896. It seems that the government of Iran is strongly against the American military presence in Afghanistan. Iran was one of the serious countries who opposed the strategic agreement between US and Afghanistan. Iranian officials often criticize specifically the American military in Afghanistan despite that there are also thousands of European and other peace-keeping troops present. 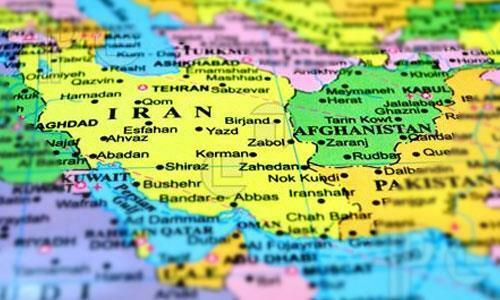 Therefore, some political analysts express concerns over escalation of Iran-US tensions as a threat for Afghanistan. While, the United States has excluded Iran's severe boycott when it comes to dealing with trade relation between Iran and Afghanistan. In the late 1990s, Iran considered the Taliban a national security threat backing anti-Taliban Afghan resistance forces, especially the northern alliance and almost attacked Afghanistan to punish the Taliban for killing its diplomats in northern Afghanistan but In December 2016, Iran's ambassador to Kabul, Mohammad Reza Behrami, sent shockwaves across Afghanistan by announcing that his government maintained contacts with the Taliban for 'control and intelligence purposes. Nevertheless, the officials from both countries emphasize that the relation between two countries have not been influenced by any third party and this will be the case in the future as well due to an existing agreement between the two countries. Since 2001 The Islamic Republic of Iran has dominated around 5million$ to the people of Afghanistan and has relatively played constructive role in Afghanistan. Accordingly, the declared policy of Iran towards Afghanistan has always stressed on peace and stability and to achieve sustainable development in this country. They took part in many large constructive projects in Afghanistan such as Construction of the Khaf-Herat Railway, which connects Afghanistan's railway network to Iran, Central Asia and Europe, electricity supply to border villages in Herat and Nimrooz, road construction of the Dogharoun-Herat road, Mahirood-Farah as well as the completion of the Herat Highway to Meymaneh in the north all have been carried out by Iranian contractors. In addition, Iran has been hosting millions of Afghan refugees for almost four decades. Presently, a large number of populations of Afghanistan dwell in Iran, even though; it decreased due to recent economic issues in Iran. For Afghan, Iran has been a great source of income and repatriation of millions of dollars to their own country annually. According to Iranians, Iran is bearing a huge spending annually for the education of more than 380,000 Afghan refugee children in Iranian schools and 17,000 Afghans in universities at different levels. Importantly, 77,000 undocumented Afghan children were allowed to enroll in Iranian public schools based on a decree issued by Iran's Supreme leader in recent years. Three Afghan students, including a girl, have attained top ranks in Iran's highly-competitive nationwide university entrance exam for a Master's degree in the current year. However, there are many Afghans that are not satisfied from Iran due to experiencing bad conducts from Iranians. Economically, the Trade between the two nations has increased dramatically since the overthrow of the Taliban government in late 2001. Mainly, Iran exports oil products, cement, construction material, carpets, home appliances, detergents, several food items and so on. Iran import nuts, carpets, agricultural products as well as handicrafts from Afghanistan. Afghanistan imports 90 percent of its needs, except agricultural products. With the construction of the Chabahar port, Iran played a unique role to give Afghanistan full access to seas and international waters. To facilitate such access, Iran provided Afghanistan's public and private sectors with sufficient facilities and preferential treatment to utilize this port. In fact, this was one of the extraordinary contributions to Afghanistan given the issues existed in the way to access the Karachi seaport in Pakistan. The first outcome of this policy was the shipment of Indian wheat cargos to Afghanistan last year.